Hi everyone! I am here today to share a card that I made with the June Kit for Scrapmaster's Paradise. This month's kit was Echo Park's Here & Now designed by Lori Whitlock. 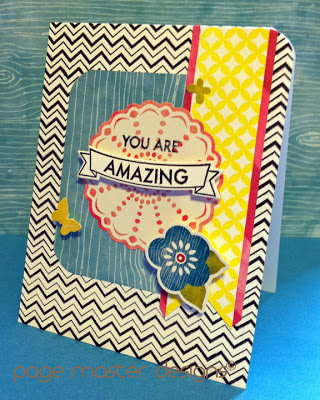 I combined some of the paper (blue woodgrain, pink strips) with the stickers (pink burst, flower, butterflies) and some SP& Co stamps (Chevron chase, Circletastic background). I used the Certifiied Awesome stamp and die for the title. Love, love, love! So fun! What a wonderful card. So many fun patterns and colors.